Not long ago, biologists made a shocking discovery. Migratory songbird populations were plummeting — and no one knew why. Where were all the wood thrushes that once flourished in our eastern forests? The Townsend's warblers of our western forests? The loggerhead shrikes of our southern shrublands? Scientists slowly uncovered the clues they needed to solve the mystery. It seemed songbirds were vanishing wherever we carved up their habitats for logging, farming, roads, and human settlements — both on their northern breeding grounds and in their southern wintering homes. Fragmentation not only made habitats smaller; it also decreased the distance between forest edges and interiors, making songbird nests nearer to human disturbances, more accessible to predators like feral cats, crows, skunks, and raccoons, and more vulnerable to cowbird nest parasitism. (Cowbirds lay their eggs in the nests of songbirds, leaving them to raise their abandoned young, which toss out the song-birds' own chicks or gobble up their food.) There was also plenty of evidence that poaching and pesticides took their toll on songbirds. And huge flocks of migrating birds collided with skyscrapers, towers, and other structures. Know your birds. The first step in aiding avian migrants — whether they're songbirds, shorebirds, raptors, or waterfowl — is to learn who they are, what they look like, where they live, and why they are at risk. Get a bird identification book or CD-ROM. Some of the best are published by the National Audubon Society and Peterson Field Guides. Revitalize a fragmented forest by enhancing its border with fruit-, nut-, and seed-bearing native plants. This lush vegetation will do double duty as a songbird buffet and as a buffer to cowbirds, predators, and other hazards. An improved forest border will also have an "edge effect" — separating habitats inside and outside the forest while forming a distinct third habitat where they converge. Different species will flourish in each habitat. Base your strategy on the amount and quality of vegetation missing. Seek the advice of a forestry expert. As a rule, the wider the edge, the better it will work as a buffer and life-support system. Keep in mind that natural forests have irregular, not straight, edges. A typical border has a layered look and consists of trees with vines twining up their trunks, then a strip of small trees and shrubs, followed by a field or other open area. Select a variety of native plants for each layer with a view to each species' sun, soil, and moisture requirements (forest edges are usually sunny spots). Ideal trees for songbirds include maples, oaks, black cherry, balsam-fir, hickory, and American beech. Climbing vines that will furnish both food and cover are wild grape, virgin's-bower, bittersweet, Virginia creeper, and trumpet honeysuckle. Some small trees and shrubs that will offer a bountiful feast include mulberry, hawthorn, crab-apple, common juniper, highbush blueberry, staghorn sumac, winterberry, elderberry, chokecherry, gooseberry, and mountain ash. If possible, water the trees, shrubs, and vines during droughts and weed out competing vegetation in the first few years. Our feline friends kill untold millions of songbirds and other small animals in Canada every year. They're partly to blame for the near extinction of certain species, including the Prothonotary Warbler, a tiny forest songbird found in southern Ontario. They also account for a high percentage of the injured wildlife admitted to rehabilitation centres. Cat owners are often unaware of the major danger their pets pose to songbirds — it's hard to believe the tabby that sits on your lap is one of the most lethal hunters in the animal kingdom. Songbirds have enough problems without this unnecessary threat. If a feline feeding frenzy is jeopardizing wildlife near you, there are steps you can take. Take stray cats to an animal shelter, where they'll have a chance to find good homes and won't be adding to the feral population. Make sure songbird habitats aren't feline friendly. 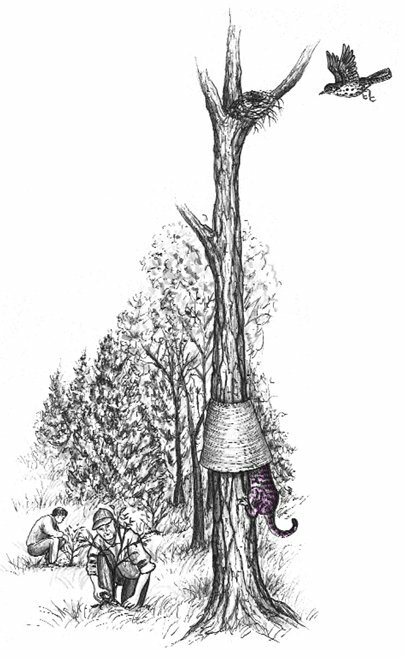 Install cone-shaped predator guards on nesting trees, mark sensitive areas with scent repellent, and plant dense vegetation along a forest edge (see "Plant a Forest Buffer" above). Address the impact of free-roaming felines on wild populations in a flyer that students can distribute locally or through a public service announcement on a community radio station. Know your facts. Get information from a local branch of the SPCA, the Humane Society, or a wild bird care centre. Discuss the effects that the estimated six million cats in Canada would have if they each killed just one bird. Dispel myths about felines — for example, that declawed, well-fed cats with bells on their collars won't harm wild animals. Research has proven otherwise. Cat owners should also be aware that feline predation is not "natural." Domestic cats have never been part of the natural food chain in Canada. There was a strange stillness. 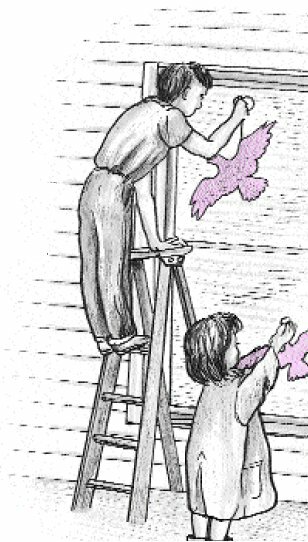 The birds, for example — where had they gone? Many people spoke of them, puzzled and disturbed. The feeding stations in the backyards were deserted. The few birds seen anywhere were moribund; they trembled violently and could not fly. It was a spring without voices. Rachel Carson's classic book awakened the world to the perils of pesticides, which harm not only unwelcome weeds and bugs but also birds in the air, fish in the waters, life-giving plants on the earth, and, inevitably, ourselves. Grow marigolds, garlic, chrysanthemums, basil, savory, or mint among schoolyard plants. Their odours and secretions repel many pests. Try manual methods, like pulling dandelions, plantain, and other weeds by hand; picking off and disposing of insect larvae; blasting pests, such as aphids, spider mites, and slugworms, out of trees with a hose; pulling off and discarding infested leaves; and hoeing the earth to eliminate weeds and to keep plants healthy and pest resistant. Attract hungry insectivores, like songbirds, bats, amphibians, and predatory insects, through habitat projects. Search a local library for books about natural pest-control methods. Share your knowledge and concerns with parents, teachers, students, your principal, custodians, nurses, and other staff. Ask interested parties to sign a pledge to reduce or abolish the spraying of pesticides in your schoolyard. Link up with others opposing the use of these chemicals. Share ideas, strategies, and information. Some helpful partners might include doctors, medical associations, cancer advocacy groups, environmental organizations, field-naturalist groups, fish and game associations, and organic gardening clubs. Write letters to local politicians urging tighter controls over pesticides. Submit a news release stating your concerns to community newspaper, television, and radio reporters. Encourage them to run commentaries on the hazards of bug and weed killers. Approach your municipal council with a proposal to prohibit or restrict the spraying of pesticides. Towns like Chelsea, Hudson, and Westmount, Quebec, have passed bylaws banning the "cosmetic use" of these chemicals. The dramatic comeback of the peregrine falcon is a story of triumph against great odds. This noble predator vanished from most of North America in the 1950s. The species fell victim to pesticides (DDT in particular) absorbed from its prey, causing females to lay eggs with shells so fragile they rarely hatched. The turnaround came in the 1970s, when conservationists mobilized worldwide to prevent the peregrine's extinction. They succeeded in getting DDT removed from the North American market. Programs to raise falcons in captivity began to rebuild the population. Thousands have since been released across Canada and now breed successfully in the wild. Today, one of the world's fastest birds can be seen again, streaking high over river gorges and in the skies of metropolises like Montreal, Winnipeg, and Edmonton. Enlighten yourself and others about falcon conservation. Invite a speaker from a local peregrine recovery team to address your class. 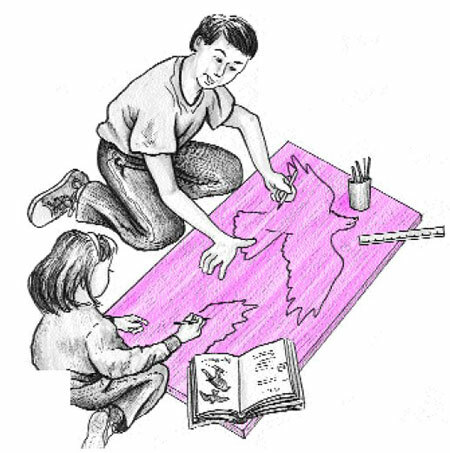 Tell classmates, family, friends, and neighbours about conservation efforts taking place in your area. Create displays for your school and community to help spread the word. Volunteer to survey falcons in cities and rural areas. Your duties could involve reporting sightings of peregrines while recording their behaviour, eating habits, and nesting success. Find out about groups that need volunteers through your nearest branch of the Canadian Wildlife Service or your provincial or territorial wildlife agency. Build nesting structures. Falcons are finicky about their homes. Rectangular boxes, carefully built and installed, have proved highly successful on buildings and natural cliffs. 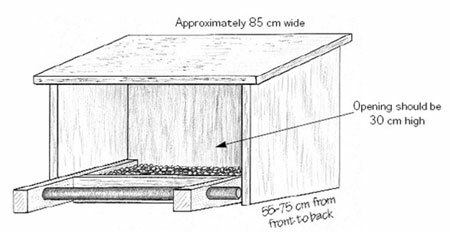 Team up with a recovery team or government wildlife agency before attempting a nesting box program. Use 2.5-cm (1") untreated softwood or any wood that resists weathering for the main structure and a 5-cm-diameter (2") wooden pole for the perch. Follow the construction plan laid out below. Cut the roof, bottom, sides, back, front, support braces, and perch. Drill small drainage holes in the bottom. Assemble the pieces using 5-cm (2") coated flat-head screws. Add 8 to 10 cm or pea gravel (not too rough or it may crack the eggs) as a nesting base. Students should by no means attempt to install these structures themselves. Have an expert mount the box in a high location near water. Cliffs, building ledges, and catwalks on smokestacks are recommended sites. Once falcons discover your nesting box, work with your conservation partner to monitor their breeding success. Countless millions of migratory birds die each year when they fly full tilt into windows. It's both the reflective and transparent characteristics of glass that make it an invisible killer. Birds see the tree reflected in a window, or the plant beyond the window — not the glass itself. Lights shining from windows are also a fatal attraction for birds migrating at night. To keep birds off this collision course, we must make glass visible to them and break up reflections on the windows of our schools, homes, and other buildings. Closing drapes or blinds when possible and moving indoor plants away from windows are among the simplest solutions. Placing birdbaths and feeders less than one metre or more than three metres away from windows will slow birds down or keep them distant enough that casualties happen less often. Planting trees away from windows will prevent them from being reflected in the glass. Sticking falcon- or hawk-shaped silhouettes to windows rarely does the trick. Dangling raptor-shaped cutouts made of wood or sheet metal on the outsides of windows with suction cups is more beneficial (the slightest breeze will cause them to move, alerting birds). Hanging ribbons, metallic streamers, or wind chimes in front of windows are similar options. Covering large windows with mesh netting (leaving space between glass and netting) will cushion the impact of crashing birds. Shutting off lights at night in high-rise buildings or schools and homes on mountainsides or, alternatively, closing curtains in illuminated rooms will prevent casualties caused by "fatal light attraction." For more information on curbing collisions, contact the Fatal Light Awareness Program (FLAP) via www.flap.org. Millions of winged wanderers need places to rest and refuel as they commute between Canadian breeding grounds and southern wintering habitats. Their survival depends on the health of each stopover along a flyway. Sadly, the habitats most important to these avian migrants are often those hardest hit by human activities. The loss of a single stopover could mean many birds never reach their destinations. You can help to keep them on their flight paths by conserving a flyway that runs through your area.